I brought home my copy of Computer Games Magazine today, and found yet another screenshots in the mag's index not seen so far. It's alot like one of the screenshots released on gamer's hell, but without the bow, and the three chaps in slightly differant poses. I can confirm that yes, at least one of them, the fat guy on the left of the shot, is a Hammerite. I am guessing that the other two fellows are Hammerite workers or other somesuch grunts. The screenshots posted below seem to have gone offline, unfortunatly. I've seen them on one other site, but I don't remember where. If you find them, email me. I found the ones I was thinking of, thanks to Azal... click here. Sadly, these are not the high res versions from the other site. I am kicking myself for not downloading them to my harddrive at the time. D'oh! They'll have to turn back up eventually. I'd first like to thank all the people who sent me these (and other) screenshots, including Yametha, Randal, MadBull#34, Amy, addlink, Adam, Sxerks, and Morlock. Second I'd like to link to them. These are the same shots as released on Gamer's Hell, but like true hell, for some reason the shots don't show up on their site anymore, so now you can get them here. Ah, brings back memories of the old days. :) I suggest you check out the site hosting these screenshots rather than just using my direct links. Thief's Shadow. - Here we see Garrett ready to knock out this poor guard with his baseball bat... er, blackjack. How can we see Garrett? Because Garrett casts a perfect shadow, that's how. Notice also the nice new light gem. Don't just stand there! - Here we see a great shot at the new bow and new fire arrow, as well as three unfortunate victims. Each one has a unique skin. I am sure that this is just the first of many we'll be seeing over the next few weeks, as E3 looms. I hope so, anyway. 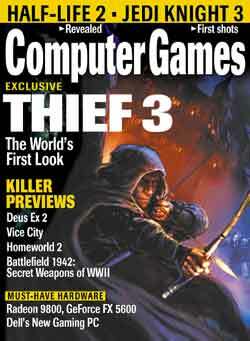 After yesterday's issue with the linking to Computer Games Magazines' Thief III article they have been especially kind in sending us a hi-res version of the image used. This image is not a scan, it is reproduced from the file used to print the magazine! The image that Jason Cross (Technical Editor) sent was over 3000 pixels tall and weighed in at over a meg, for bandwidth reasons I have halved the size and lowered the quality slightly, so it is now around 200kb. Now, Jason didn't have to send the image, but went out of his way to give something to us lot, so big thanks to him!! The Thievery UT site has an update for version 1.4 of their Thief MOD for Unreal Tourament. In this thread on our forums a few scans of a Deus Ex: Invisible War and Thief III article from the June issue of "Computer Games" magazine! Now for copyright reasons we cannot upload and show the images on this site until the next issue of the magazine is out. Stephen Russell will reprise his role as our master thief, Garrett. A tentative release date that "sounds about right" to project leader Randy Smith has been set for February 2004. The story will finish that which was started in the original Thief game, The Dark Project. The story will centre around the mysterious Keeper faction as was the late Looking Glass' original plan for Thief III and much more besides! Rest assured that when it is legal for us to put up these scanned images, it will be done! UPDATE: We have been asked by Computer Games Magazine to remove the links to the articles and point out that it is not legal to post the scans of the magazine at any time. It appears we were erroneously informed by another organisation that it was legal to do so. Apologies to Computer Games Magazine for the blunder! Now, if you want to see those scans I suggest you head off to the newstands and pick up a copy of the magazine yourself! I'd like to thank everyone who sent in emails about dead links, but there's no need. Our file host is doing some mantenance to find ways to limit bandwidth usage (therefore ensuring that he can remain our file host for much time to come) so not all files are avaliable at the moment. Thank you for your patience and understanding. Randy Smith was interviewed by Ain't it Cool Games. No big news here, but an interesting read nonetheless. The CoSaS website is now back on our server. Thank you, Jason, for hosting it for so long. Gone is the site of old... sort of reflecting our new "no frills, just the goods" attitude about the whole thing. (I am not going to use valuable time I could be dromeding to work on the cosas website, for example.) The main update is in the Q.A. section of the site, which a totally new section devoted to Mission 2 of the campaign. I think it's about time we gave a little more info on it. You may notice that some content from the QA has changed. This isn't because those features were taken out... it's just that I felt it was needless babble and was out of place. Again, no frills, just the goods.... good, quality, goods. Keen Thief fans will no doubt be aware that the 1st Cosas mission was released recently to great excitement. To make people aware that, once Cosas is released and played, we still have not one major fan campaign (Thief2x) but two (The Hammerite Imperium) to look forward to, I am just writing to inform the community that the latter is still looking out for major level designing talent and concept artists who have a good knowledge of the possibilities that Dromed is capable of and a desire to push them still further with ground-breaking new ideas. As the Hammerite Imperium will be one of the most ambitious projects yet, we are particularly on the lookout for technical innovators who can push those boundaries and make even our more outlandish ideas manifested in the game. This is why the exceptional quality of such activities as Komag�s fan mission contests has duly attracted our attention. We want to see what you can do to take Thief on to better and better standards. Our aim is nothing less than to attract the attention of Ion Storm for an officially recognised prequel. It also deals with the origins of such characters as Constantine and Victoria, staying true to the spirit of the original Thief game and taking the whole Thief universe into a new dimension. The theme of Imperium is clearly more focused on the Hammerite religion and chronicles its downfall. The scope is therefore very wide and brings in a more expansive sort of �Lord of the Rings� setting with a nod towards the Arthurian inspiration of the original game. Its hero travels through major points in a disastrous period of history for the empire before the birth of Garrett. This project is presently written for up to a total of 10 missions with all central concepts being worked through for the main story arc, and looks set to cleverly assimilate much of Hammerite lore in a seamless fashion, whilst expanding greatly on the existing ideas. This is not to say, however, that your individual contribution will not be welcomed as we need very talented craftsmen to work within some guidelines on the mission design. These missions do permit a certain amount of individual flair mainly due to the densely populated world that is being created. We are hoping to make the gameplay of the Hammerite Imperium a little different as well, allowing the player to make choices and permit a bit more interactivity. This may make the player to do a bit more thinking than usual instead of simple exploration. Ideally, then, we are looking for a team of people to work on single fan missions with people specialising in architecture, special effects and the general look and feel of the mission. This is because the main character will be moving around a lot in the Thief world and each location will be quite different than the next. So come on, Thief community, let�s show Ion Storm what we�re made of! Above all, this is a project made by fans for fans and one of the most valuable qualities you can have is a passion for Thief. All those interested in the challenge should contact either Alexius at doctor_vit@hotmail.com or myself, Ibsen�s Ghost (aka the voice of Skarz in Cosas), at Ibsen3@msn.com . Garret snapped back into an upright position as he felt something move behind him in the dark. His hand immediately went to his side, he felt the coldness of the scabbard, and the leather bound hilt of his sword. He eased back into the alleyway, away from the mouth, and let the dark night swallow him up. Closing his eyes as he flattened himself against the wall, he felt two shadows move, nay, and three. He opened his eyes, which had long ago adjusted to the dark, and began to search the rear of the alley in a zigzag pattern. Instead of touching his sword hilt, he grabbed it and unsheathed it, carefully in not to let any light reflect off the polished blade. Placing one foot in front of the other, he made his way further down. Updated versions of Azrarhn's Mr Chuz and Dave Heitzer's Bluecoat's Training Facility were released today. Mr Chuz has been updated to version 2.0, fixing the bug that caused objectives to not be checked off when completed. Wow, here are four new Thief 2 fan missions that were all released today. Enjoy! Plot Description: This time Garrett has to steal a precious gadget from Lord Alan�s Fortress: The Cube. Plot Description: No one knows where he came from or how he got the Hammerites to let him dig in the recently discovered ruins of an ancient temple. There is also rumors that the local Thieves guild has struck a bargain with DrDragon to see that no one gets too curious or too close to the castle. The castle is full of tension and everyone's ready to come apart at the seams. It's not even safe for a guard to wander the outer grounds. The Hammerites are getting more agitated by the hour since they have received nothing from the Dr for their trouble and their spy working in the castle hasn't been heard from for weeks. But a man who claims to be the spy's brother gives you a map of the castle. Plot Description: You've come to find the lost books of Targus an ancient writer of Magic Mastery. Alright... We're in! Now begin the search for the books "In The Basement?" Well we had to get in somewhere. But maybe we well get lucky here and find a few trinkets for the retirement package. Additional Comments: This is the Second of a 5 part quest to find the books of Targus. Morrgan's second review is of Gumdrop's small Thief 2 fan mission, Hedgerows & Hammerites. She gives the mission a final score of 6.5 hammers! Pros: Solid architecture in all areas; several interesting puzzles. Cons: Not much of a story; the interesting puzzles can turn out to be frustrating. Bottom Line: A well-made but small mission, worth the download. If you like puzzles, this is something for you. Maria Str�m (aka Morrgan) has done a review of John D. Head's fan mission for Thief Gold, Burglary in Blackbrook. She has awarded the mission a score of 5.5 hammers! Pros: The subplot makes the mission more interesting; well-written texts. Cons: Architecture is plain; some AI placement could be better. Bottom Line: Don�t let the lack of eye candy scare you off. It is not the most outstanding FM out there, but it has the atmosphere of a true Hammerite mission.